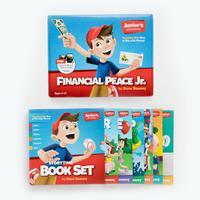 Financial Peace Junior is designed to help you teach your kids about money. It's packed with tools, resources and step-by-step instructions for parents. What can be intimidating is made ultra-easy. There are ideas for activities and age-appropriate chores, and you'll have all the tools you need to make learning about money a part of your daily life. Your kids will love the exciting games and toys. The lessons of working, giving, saving and spending are brought to life through fun stories in the activity book, and your kids will love tracking their progress on the dry-erase boards! Financial Peace Junior doesn't just give you the tools to teach your kids to win with money — it shows you how. 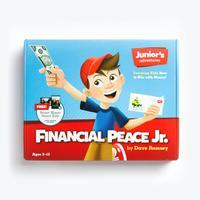 Financial Peace Junior is designed to help you teach your kids about money. It's packed with tools, resources and step-by-step instructions for parents. Financial Peace Junior doesn't just give you the tools to teach your kids to win with money — it shows you how! 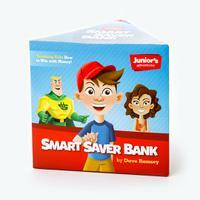 Teach your kids how to spend, save, and give with the Smart Saver Bank! It has been completely redesigned to make learning about money even more fun. Three compartments labeled SPEND, SAVE, and GIVE make it easy for kids to budget their cash. The heavy-duty plastic and silicone top make the bank durable. Plus, the bank is transparent so kids can see their progress! Clear plastic bank split into three compartments for SPEND, SAVE, and GIVE. Silicone top with slots for coins and bills. Three plugs on the bottom for easy money retrieval. 1 FREE audio lesson about SAVING from the Smart Money Smart Kids class. Your children can join Junior in these six fun-filled adventures! Transform their futures with these colorful and entertaining books by teaching them how to handle money now. From working and saving to giving and spending, these wonderful stories will teach your kids real-life lessons, and the stories are so much fun that your children won’t even know they’re learning! Recommended for kids ages 3–10. 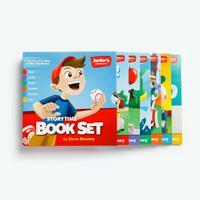 What Books Are In the Junior’s Adventures: Storytime Book Set? 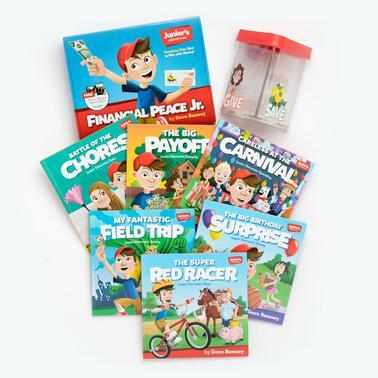 This pack includes Financial Peace Junior and the six-book boxed set of Dave's illustrated kids' books. Use these helpful tools to teach kids lessons about money and the importance of giving, saving and spending on a plan.